With a six-wicket victory in the fourth and final Test match at Feroze Shah Kotla in Delhi, India completed a 4-0 whitewash – for the first time in its Test history. For Australia, this is the second time they suffered a 4-0 whitewash in a four-test match series. The last time they suffered the same humiliation in 1970 against South Africa. They also suffered a 3-0 whitewash against Pakistan in 1982. The fourth Test ended in less than three days with spinners ruling the roost. Resuming from the overnight score of 266/8, India bowled out for 272 in reply to Australia’s 262. Vijay (57), Pujara (52), Tendulkar (32), Dhoni (24) and Jadeja (43) were the top scorers. Nathan Lyon took seven wickets. Australia’s dismal performance continued in the second innings, as they bowled out for a paltry 164, setting a victory target of 155 for India. Peter Siddle became the first player in the history of Test cricket to score fifties in both innings of the match while batting at No. 9. 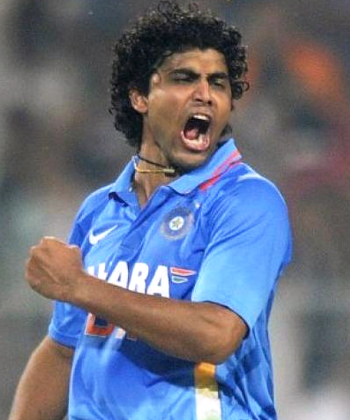 Jadeja took 5 wickets, while Ashwin and Ojha took two wickets each. Chasing a victory target of 155, India lost Vijay early. However, Pujara and Kohli added 94 runs for the second wicket to set the match in India’s favour. Despite losing Kohli (41), Tendulkar (1) and Rahane (1) early, India achieved the target, thanks to Pujara (82*) and Dhoni (12*). Lyon and Maxwell took two wickets each. It was Dhoni’s 24th win as a Captain. India won the Border-Gavaskar Trophy after two years. Ravindra Jadeja, who took seven wickets in the match and scored a crucial 43 in the first innings, was declared ‘Man of the Match’. He took 24 wickets in the series. Ashwin, who took 29 wickets in four matches, was declared ‘Man of the Series’.